The Golden Dames Project - Page 2: Betty Bates Takes the Case! 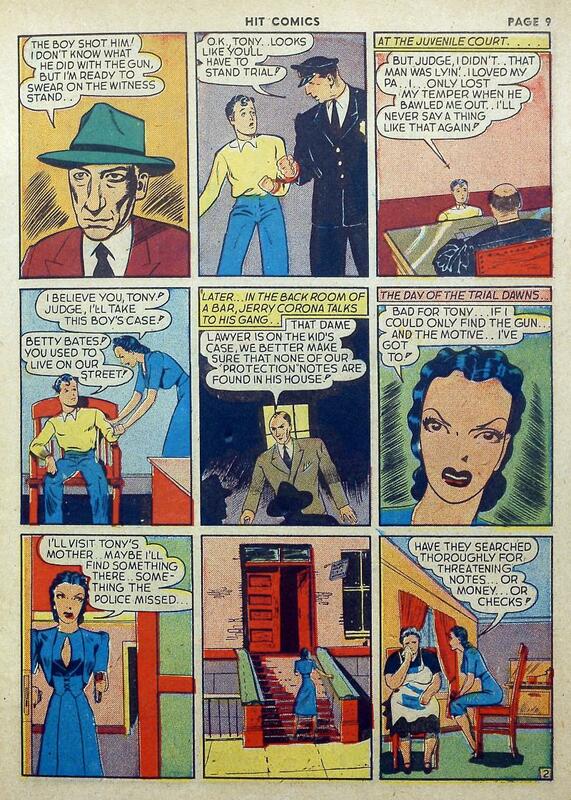 Page 2: Betty Bates Takes the Case! Tracking down information on who did what, specifically, in the golden age. Publishers weren't as forward thinking about credits as they are today. Often only one name is on the comic when multiple people worked on it. Even more confusing, creators often used different pen names depending on which company they were working for at the time. To add another layer of complexity atop that, publishers sometimes contracted out content creation to an entire studio such as the famous Eisner and Iger Studio. That isn't even taking into account how some creators, such as Bob Kane, got credit for work they didn't even do. That being said, the man credited with creating Betty Bates and writing this particular story is Stanley Charlot. Charlot was the pen name used by Bob Powell, a rather prolific artist and writer who worked for Will Eisner at his studios. Working for Eisner, Powell's work appeared in books for multiple publishers and he is credited with work on stories featuring the Spirit of '76, Mr. Mystic and the first Blackhawk tale. During this time Powell became rather well known for his "good girl" art, including work on Sheena, Queen of the Jungle. Like many artists, Bob Powell entered military service during World War II - specifically, the Air Force. After his discharge Powell formed his own studio and did work for a number of different publishers including a stint at Marvel Comics in the mid-60s. At Marvel, Powell worked on stories featuring Giant Man, the Human Torch, the Hulk, Daredevil and, believe it or not, the Beatles. Powell also provided art for the infamous Mars Attacks trading card line from Topps. Bob Powell died in late 1967. At the time of his death he was the art director for Sick magazine, a contemporary of the more famous MAD magazine. Betty Bates is on the case! I'm guessing since she "took" the case instead of being assigned it, she's not a public defender but a private lawyer at this point. It's possible she was a public defender, since the boy obviously wouldn't have been able to afford one on his own. Overhearing the circumstances, she might have offered to help the kid pro-bono, or however you spell it. TC, bless you for commenting. It can be lonely at the start of a new webcomic. You're right. of course. She's got to be working pro-bono for the kid. I doubt a peddler's widow can afford a lawyer in the 1940s. My guess is she's not a public defender, though, since in later stories we see people coming to her to take cases rather than her being assigned them. My guess is she just happened to be in the courthouse on the day of the poor kid's arraignment. If you wanted to choose fish which of these buttons would you pick?